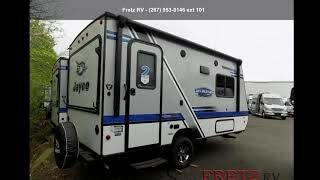 Hi, I am interested in your 2018 JAYCO Jay Feather (stock #13534) listed on Autotrader for $14,888. I'd like to get more information about this vehicle and confirm its availability. This unit includes Jaycos Customer Value Package, Fantastic fan & (2) aluminum rims. This Jay Feather 7 model 16XRB expandable by Jayco offers rear and front tent end beds, a bench sofa, and rear bath. As you enter this expandable, to the right is a kitchen sink, two burner range, bench sofa, and overhead cabinets.Along the opposite side of the expandable you will find a dinette and a refrigerator with overhead storage.The bathroom is located in the rear. The bathroom has a toilet, corner shower, and a sink.The front bed includes overhead storage and a cabinet. The rear bed has an overhead shelf.You are sure to enjoy the outside 12 awning, exterior storage compartments, plus much more!